in Obedience and is beginning Flyball and Agility! Talk about a versatile Manchester! girls but has recently come home to WhirlWynd where he will lovingly warm our hearts, our laps and our beds permanently. began her show career (September 2007) and we have high hopes for her in the show ring! 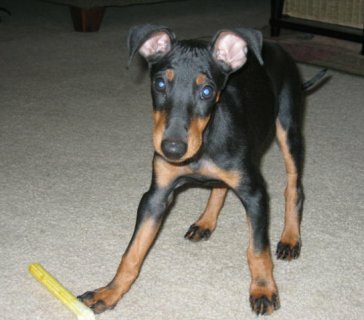 This breeding is what is known as an "outcross", meaning neither dog share common ancestry in their pedigrees. 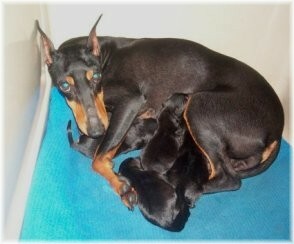 It is not all that common of breeding practice, however, Devon and Asia are wonderful examples of the Manchester Terrier both in type and structure and by breeding this pair, we have produced another litter of exquisite quality WhirlWynd puppies that will carry on their parents' wonderful qualities. Due to the quality of both the sire and dam of this litter, we are very pleased with the exceptional quality of these puppies that will also infuse another long time well known line (Bit O Luck) into the WhirlWynd line. Both Shal-Mar (Gerrie Hart) and Bit O Luck Manchesters (Kenneth and Cloydett Stickney) have been producing top quality Manchester Terriers for well over 20 years. Their dedication to this breed is highly respected and well known throughout the Manchester 'Community'. 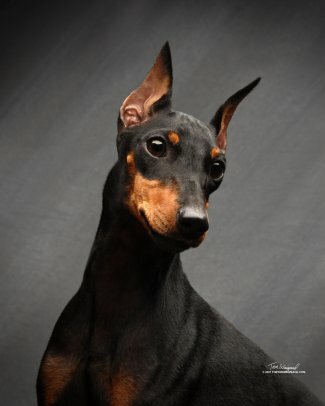 Gerrie Hart has produced multiple Group Placing/Winning Manchester Terriers, as well as, breed winners at the American Manchester Terrier Club's National Specialty shows. 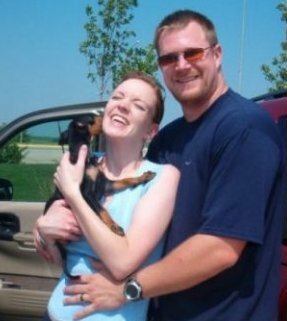 Kenneth and Cloydett Stickney have produced multiple champions over the years, as well as, many earning a place in the Hall of Fame. 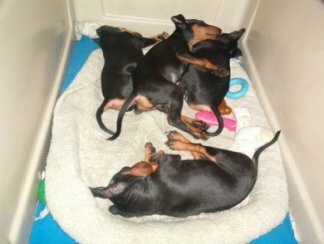 It is our hope that by bringing these two 'lines' together, we will continue to produce top quality Standard Manchester Terriers that conform to the AKC Breed Standard of Perfection, as well as, carry on the Bit O Luck line. Devon (who resides at WhirlWynd) and his litter mate, Bit O Luck Jazzanna Ace (who resides with the Stickneys) are the last "true" bred Bit O Luck male Manchesters. I am proud to be able to carry on their lines with this breeding.